Battles with enemies, who may retreat. Sieges with cities, who may not. The battle and siege maths may not be that clever. I've had crazy overtime at work the last 2 weeks which is good for my wallet but terrible for SPQR. Despite this, I've made a good start on the battle front. Pygame doesn't do a lot, but in some ways thats a good thing because I can fit it all in my brain. It also WORKS - havn't come across a single bug in 6 or so years of use! Essentially, the battle code is 95% complete, which means I can move onto the siege code (very similar, really). 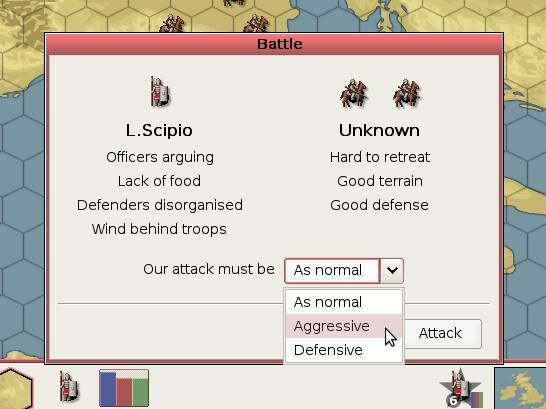 Although the battle screen looks the part, nothing special is really going on under the hood, we'll leave that for a later version (but all the parts needed are in place, so major revisions shouldn't be that hard to do). Once those are in place, I'll get around to adding toeholds new gfx, and get decided on hex sizes properly. Heya. I thought you fell off the deep end wrt SPQR, and I drifted to looking around at more active projects. With regard to what I started/promised: I ended up doing a world version of the world map (see here: http://jkwchui.deviantart.com/art/Detailed-Watercolor-World-Map-164331445), and it should be a simple matter for you to crop the right piece out from there. Good luck on the project. Back on the code, and I've REALLY gone and got rid of a heck of a lot of code. Essentially, all the data for cities and units has gone, and most of the code. All we have now is an empty map. I'll put back in the mini-map in the next few days, then add a few regions, and then some units again. The basic roadmap for 0.4 still holds.